My intention at the beginning of Luke1428 was to only write about what the Bible had to say about money related issues. I realized about 30 posts into this endeavor that my knowledge about personal finance and my passion to share that knowledge went well beyond what I knew from the spiritual angle. I had so much more to offer. So I decided to expand my writing horizon and discuss areas of personal finance where I had knowledge without necessarily linking it to a spiritual component. In addition, I began to write about my running, our rental properties, my personal goals and, like today, the practice of blogging itself. This created a pool of new ideas on which to draw from. Not only did stretching my content areas create a bigger pool of blog post ideas to draw from, but it also gave my website more value in terms of its usefulness to the reader. It also kept my writing fresh. I wasn’t covering the same topic or themes day in and day out (although that may be necessary if you are trying to provide content for a very specific niche). So step number one to coming up with more blog post ideas is to think how you can expand the available pool of topics. Even if you have a very defined niche, most likely you can find ways that it connects to or intersects with other facets of life. George: “No, no, no! Nothing happens! That’s true of all of us who blog and our readers. We are all interested in watching stories unfold and more importantly, we love learning from those stories. But we won’t know your story unless you publish it. Stories happen everyday. In the personal finance niche, the story about the clueless checkout clerk that messes up a transaction needs to be shared. That time as a kid where you lied to your parents about money needs to be shared. What personal struggles you are going through and how you are working through them needs to be shared. Use the experiences of your life to develop content. Think about every situation as a potential blog post. You also interact with family, friends and co-workers everyday. They have stories to tell and questions they ask you all the time. Just be sure to keep their names anonymous or ask permission from them to share. I love to read and share work from other blogs. Some of my favorites can be found in my blogroll. It’s through my reading of other people’s work that I come up with some pretty good ideas. Now, just to be clear, I wouldn’t condone stealing other people’s work. But I’ve already established that we all have our own story to tell in our own way. Another blogger does not share the same writing voice as you and may not tackle a problem/issue from the same angle as you. So perhaps you can take a topic someone else began and explore it in a more in-depth manner. Maybe something they wrote sparks a question in your mind you can develop a post around. It’s possible they wrote something you disagree with and that spawns a post on the opposing viewpoint. If you play off another blogger’s idea, give them some credit in the post you write. Say something like, “The other day when I was reading at…”. Then link to their article in the body of your post. If they are a blogger in your genre and you plan to write a post disagreeing with their position on a topic, email or direct message them on Twitter ahead of time so they know. Not only is this a professional courtesy, but it lets them know you’ve been reading their blog. They may just return the favor and read yours on the day you publish the contrarian post. Old content you have written can be another valuable source for blog post ideas. Granted, a new blogger will have to wait a bit until some content has been established on the site for this practice to be helpful. Once you do however, routinely review the articles you have written and reuse or recycle one for a new post. The first time I went back to get an idea from an old post it felt dirty. It seemed like I wasn’t coming up with new, original content and was cheating my readers because they had already read that before. 2) Your regular readers have likely forgotten most of what you wrote six months or a year ago anyway. 1) Republish it as is (noting when it was originally published). 2) Reword it, using the same main idea but with new examples. 3) Expand on it. Find a particular point in an old article and develop a new post around that. Even if you aren’t having a difficult time coming up with blog post ideas, I would recommend reviewing your old content at least once every six months. Just scanning through your list of articles can be a beneficial exercise. Whatever your blogging niche, most likely there is some form of major news media that covers your topic either in print, television or online. Their publications can be a great source for ideas to pass on to your readers. This happened to me just the other day. I was reading financial news online and ran across a video segment by CNBC on Yahoo Finance. The short video about the direction of the markets sparked an idea for a post on long-term investing which I wrote and quickly published the next day. Again when taking information from a media source, never plagiarize and always give credit where credit is due. Ideas can come at any time and in some really weird places. I’ve thought of ideas while in the shower, when running, in the doctor’s office and even in the middle of church. So, if possible, keep something with you to jot down your ideas when they occur. Ideas are tough enough to come up with. You don’t want to lose them because each one is a post. Questions: How do you come with blog post ideas? Do you do anything creative when stuck for content? I’m pretty good at finding new topics from everyday life, magazines and the news. I do find some ideas when commenting on others posts too. Sometimes they talk about a topic but I have a different view or modify it into another topic. “…a different view or modify it…” I know when I first started blogging I felt like I couldn’t write about something that someone else had done. Know that sounds silly but as a novice that’s how I felt. I quickly realized that my view and perspective mattered. In fact, that’s what really makes bloggers stand out…bringing their own voice to the topic. Thanks for the advice Brian. I can see how sometimes it’s tough to think of a blog post. I don’t blog consistently enough for me to run out of ideas. And you’re absolutely right that even if it’s been done before, each person has their own perspective, experiences and writing style to put a new light on the topic. Also love Seinfeld and that was a great episode! The more a person writes articles the more challenging it is to keep fresh ideas coming. That’s why I think just using the days of our lives for material is the best practice. If I really focused there is probably at least one thing a day I hear/see (an action, a comment overheard, a news report) that I could develop a post around. Thanks for Sharing Brian. Sometimes that writer’s block can be a really stubborn thing, and it’s difficult to have new ideas without sometimes feeling like you’re just covering something that’s already been done again and again. I do appreciate your ideas, and will definitely be using some of them for myself! “…something that’s already been done again and again.” I feel that way sometimes…that I’m writing stuff everyone else has already done before. Then I just have to remind myself that no one has my unique perspective on the topic. Plus my writing style may connect with someone like another writer’s style may not. My husband always jokes when something happens because it will become a blog post, and that’s certainly true! I originally started the blog to track our journey out of debt, but the blog helped us pay it off so much faster. If I’d stuck to the original idea, it would have been a 6 month blog. I think sometimes I feel some posts are more helpful than others, but you never know who might be reading and having the same experiences in their lives, so I don’t think anything is too irrelevant as long as it loosely relates to finance. That’s a great point! As our ideas about our genre evolve and we gain more knowledge, what we wrote before may not be relevant. I have found a few ways to find ideas on this blogging resource blog I discovered. There’s actually an art to finding blog post ideas! I do find that my day-to-day life does generate most of my ideas, and we have a shared Evernote notebook called “The Well” where we put various post ideas. That said, commenting other blogs is a great way to get the mind going as well..
Nice call on Evernote. That’s a great life management tool. So is outright stealing not allowed? Huh, you learn something every day. Great tips, all. I’ve found that writing begets writing, and that some sort of regular habit of writing is a decent way to keep writer’s block away. Inspiration is usually an excuse I use (if only I were inspired, the words would come! )….my truth is that writing, like everything else, is pretty much just work. Put something in, get something out. I always write what is important to me, or perhaps in answer to what someone has asked me. I do sometimes get a block, and it is sometimes telling in the lack of quality in a particular post, but I usually don’t have too much trouble finding a topic I’m interested in to write about. “…it is sometimes telling in the lack of quality in a particular post…” That is when I feel the worst about publishing something…when I know/feel it’s not very good. A couple of times I’ve just trashed a post and skipped a day of publishing because I didn’t want poor content on the site. CNN Money is my go-to when I’m out of ideas. Every singe time there is always some story or opinion that I can put my own spin on. I’m totally on-board with recycling content. It’s impossible for people to know all your blog posts. So you might as well freshen them up every now and again for new readers to see. The other reason we should not feel weird about recycling content is that we grow as a writer and improve at what we do…hopefully. So all those posts that were dreadfully written at the beginning can be resurrected and written better. I always get great ideas when I’m running. I had an assignment last week to come up with 60 blog topics. I struggled but I got it done in two days. Another good place to consider is answer boards. Look and see what kinds of questions people are asking about and use it to inspire a post. That’s great you had an idea creation power session like that. I need to have more of those. I love the idea of getting topics from answer boards. I can see how you could easily generate ideas based on what others are asking. I use one of the lines from that exchange regularly. When I see a really bad TV show, I’ll comment that ‘people will watch anything simply because it’s on TV’. I used to fear this so much when I first started blogging. Theoretically, I had lots to say but what if I ran out of things? And when I started I was only posting once a week! 🙂 I get so much inspiration from fellow bloggers and comments on the blog. And while I overall stay focused on children and money, I am branching out a bit too. The reality parents are less inclined to talk to kids about money when they don’t feel good about their own financial situation. And as a fellow runner, I bet some of your best ideas come when you’re running … of course, the trick is remembering them afterwards! I love that the main focus of you blog is on children and money. I can tell you have a real passion for that area of personal finance and you communicate it very well. And that’s good point about getting ideas from the comments of your blog. I should have mentioned that as a resource because I get ideas from there as well. I think we’ve all been in a situation where we simply can’t think of what to write! I used to write 5 posts a week for the first 8 months or so of my blog before I had Sally and Cat on board with writing once a week. I’ve always kept a notebook where I write down ideas as they come to me. 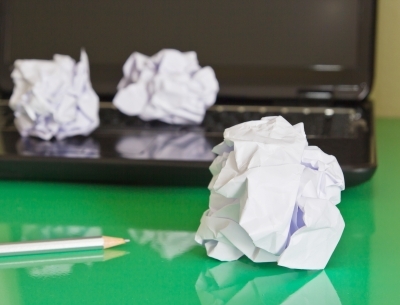 Ideas will come at random times so it’s important to get them down on a piece of paper before you forget them! I don’t think I’m ready for the commitment of writing five posts a week. That must have been quite a challenge. I keep my file of my ideas in a Word document. Not putting the stress on yourself is huge. I’d rather read the odd intermittent well written and thought out post that a bunch of half-a** posts daily. If I don’t feel like writing or totally suffering from writers block, I just don’t do it! It comes in waves for me. When I’m having an inspirational period I try and power as many posts as I can to make up for the lulls. I will never write on a topic I know nothing about, or a topic I don’t care about/relate to. “When I’m having an inspirational period I try and power as many posts as I can…” That’s a great strategy Catherine! Thanks for sharing that suggestion. It can definitely help to have some posts saved up for those times when you can’t think of anything. I’m still trying to learn how to work ahead. I have my moments of writers block. For the most part I get ideas just randomly but I notice it a lot more when I’m cleaning or working out. Then I just jot down the title. I also get ideas from what other bloggers write, and sort of “answer” what they say. I know there is probably not a lot of useful info in my blog that someone hasn’t read before, but for me I love reading about an individual’s personal journey…getting to know the person behind the blog. If all I read on someone’s blog is 10 steps to…I eventually turn away. So I keep that in mind with my own blog that it can take a well-rounded approach, thereby giving me more ideas to work with. “…I notice it a lot more when I’m cleaning or working out.” It would seem strange but I think there is something to both of those activities being idea generators. I’ve noticed having great ideas at those times as well. Perhaps both are involved in purging the brain of junk that blocks our ability to think clearly? I can sooo relate…some of the best ideas I ever had came to me while I was either cutting the lawn or showering! I just have a massive list of drafts from things that happen to me or ideas that just pop up. If I don’t have a topic on hand, then I just go in there and see what strikes me. That’s where I’m at Grayson…too much on the list to write about, so little time. I keep a list of ideas that I add to when I’m feeling creative. Then, whenever I’m going blank, I just consult the list. Works every time. I definitely go through ups and downs in terms of coming up with content and absolutely use some of these tips here. One other thing I’m trying to do these days is participate more in online forums to see if I can find good post ideas there. The nice thing about that is that you can find actual questions that real people have. I’m working more into online forums as well Matt. Not only is that a great place for idea formation but it also helps you connect with other people/bloggers who may turn into future readers of your site.